Invited my sister and brother in law for brunch on Labor Day morning. I love brunch, and think it's a nice, easy, casual way to entertain. I set the table and made a breakfast casserole the night before, then cut up fruit and toasted English muffins in the morning. Easy peasy to get it all together in 24 hours, and that included a supermarket run. 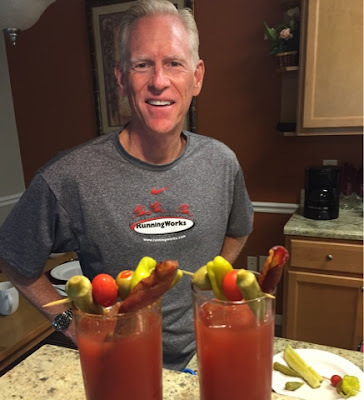 Hubs made his famous and fabulous bloody marys, each one hand-crafted, and they were so good. He did 'labor' over the garnishes though, which included pickled okra, olives, pepperoncinis, and a bacon swizzle stick. It turned out to be a really relaxing morning with good food and family. Somewhat well informed, although does any one person understand it completely? A civil war has been going on there for several years now, and this is more of the fallout. There is much discussion and disagreement as to where everyone will live, how they will be integrated into new countries and cultures, how to determine if each and every person is on the up and up, what to do about the children, education, healthcare, food, shelter, and on and on it goes. I've read quite a bit about the challenges the refugees and the world face, and while I know it's a complicated mess, my heart breaks for parents running from their homeland with babies on their backs. Brussel sprouts? I despised them as a child, but they're one of my favorite vegetables now. Hubs was with me so I remained calm. There were a fair number of people inspecting the trap and one young man was making an attempt at grabbing it with his bare hands, but another more resourceful person grabbed the net and fished him out. Hubs reassured me that in spite of a small child shouting, 'That's a water moccasin! ', the snake was in fact a common, harmless something or other. He also reassured me that's what pool traps are for...capturing unwanted critters and keeping them 'trapped', so I carried on swimming. Remember the TV dinners that were divided into little compartments with one designated spot for each part of the meal? Do they still make those? I haven't had one since I was a kid, and even then we only had them when my parents were going out for the evening. A TV dinner somehow felt like a huge treat, and I remember in choosing what kind we wanted it was all about the dessert. Ordering dinner is still kind of like that for me-ha! These days my idea of a great TV dinner is a big bowl of popcorn. I agree. I think mothers and fathers leaving the only land they've ever called home, with nothing but their babies and the clothes on their back, facing an uncertain future in a place where they may not be welcomed with open arms, takes a whole heap of courage. I think the second greatest virtue is integrity, because without it the others I could mention herearen't worth much. Caribbean, Cincinnati, and ninety are three words I always have to think twice on when writing. Like just now I went back and looked at them again to be sure I had it all right, and even then I hit spell check on my post. Aaaaand of course I had an extra t in Cincinnati. Bother. Let the ground breaking commence! Today's the day-whoohoo!! I don't think I would have continued swimming,if a snake had gotten into the trap-I don't care what kind of snake it was! Woohoo on the ground breaking! That is so funny you changed your mind about the Brussel sprouts!! I really tried but still despise them! WOO HOO for breaking ground!!!!! So happy to hear that TODAY is THE DAY for the ground breaking!!! After over two months of agony, when their first buyer backed out, last minute, Brad and Jennifer have finally sold their house again. If all goes well, they'll close on Oct. 2. Fun and funny answers, Joyce -- hope the start to the house is as exciting! You are a braver lady than I am Joyce! Congrats on the groundbreaking. Hope it is smooth sailing from here on. Yay for groundbreaking! It's going to finally start to feel real. I want one of those Bloody Mary's, looks awesome! Great answer on Brussel Sprouts, I feel the same way. My dad still buys some TV dinners and I believe they are still divided. I didn't think of ninety but I also look that one up often. Congrats on breaking ground today! Sure hope the rain holds off so your ground-breaking can start! We got a lot of rain here this morning. Brussel sprouts just aren't for me. I've tried to like them, but I just can't do it. I agree that it was all about the desserts with the TV dinners. When i was a kid, if it had a brownie in the dessert compartment, that was the TV dinner for me! When they started making Mexican TV dinners that was tough because they didn't have desserts, but Mexican, but no dessert.... Rough on a kid in the 70s! The funny thing is now my husband chooses h Hungry Man dinners for work the same way; the trays are plastic for the microwave now, but he prefers brownies in that compartment too! I look forward to seeing pictures of the house going up! I hope the crew can stay on time - and you can enjoy the process! (Have you ever built before? Oh lordy!) Those Bloody Marys look delicious!! Cincinnati gets me, too. I even have a BIL who lives there, so you'd think I 'd have mastered it by now. I can never remember if it's double n's or double T's. They just write Cinci. I think I'll adopt that spelling. :) I've changed my mind on Brussels sprouts, too. And I cannot even let my mind think too long about the Syrian refugees. It knots my stomach. Such a traumatic and complicated way for them to have to deal with life and death. I still don't have a taste for brussels sprouts. The flavor is so strong. Enjoyed your hodge podge answers. I'm with you on the popcorn dinner... my kind of cooking! I would never ever ever ever ever never swim in that pool again. Ever. Never. Joyce, I certainly hope your ground-breaking happened on schedule!! What an exciting time this is!!! AND I hope your chair situation improves. If the ergonomics for my computer and my sewing machine are not right, I end up at the chiropractor!! I don't think I could get in the pool again so you are a braver woman than me. Congratulations on the ground breaking. Hope it all goes smoothly, it will definitely feel like things are starting to happen! I would be scared to reenter that pool again. Those Bloody Mary's sure look tasty and refreshing! ... I'm thinking you purposely misspelled Hodgepodge... what a kidder you are! Enjoyed the questions this week! Oh, so excited for you and the breaking of ground on your new house. Now, if I can just get home from Oklahoma my decorator and I might get ours decorated. It's been a wild couple of weeks with the arrival of our little Coleman. But, he's due to come home tomorrow and hopefully all is going to go well. I hope to be back with the HP next week. Happy weekend! SWMBO says hello, too, extending her warmest regards. Thanks for stopping by! For some reason I cannot get it to link up with you.